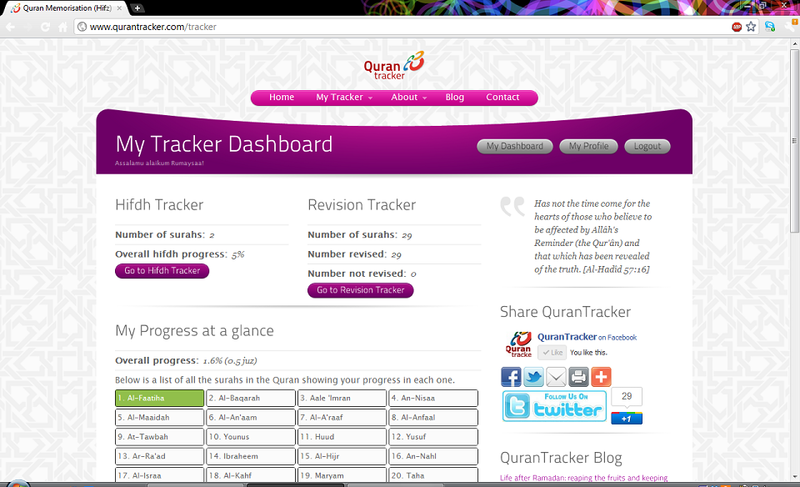 You can now see how much of the Quran you have memorised on your dashboard just under the ‘My Progress at a glance’. How much you’ve memorised is shown in percentage and in the number of juz (or ajza) you’ve completed. We hope this will be useful for motivation inshaa Allah. Watching those numbers go up should be very encouraging and satisfying! You can view the progress you’ve made in a surah that you are learning in your Hifdh Tracker just by putting your mouse over the progress bar. Hover your mouse over the progress bar for a second or two and how much of the surah you’ve completed so far, in percentage, is shown. This feature has actually been available for a while but it is not mentioned in the slideshows so you may not be aware of it. We’ve added a new background to the selection of backgrounds. It’s a classic ‘Islamic’ geometric pattern. Try it out, it might be refreshing to have a new look to the site. Once you are logged in, just go to ‘My Profile’ and edit your profile to change your background. QuranTracker now remembers which reciter you choose and will keep it on your last selected reciter whenever you login or move around the site. This is will keep it on your favourite reciter without you having to keep changing it. Hope you find these changes useful inshaa Allah. As always, feedback is very welcome. Posted on 11 December 2011, in Uncategorized. Bookmark the permalink. 9 Comments. Baarak Allahu feekum. May Allah grant us all success. Ameen wa baarak Allahu feekum.